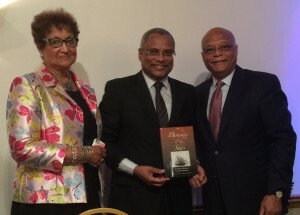 The Schooner Ernestina-Morrissey Association (SEMA) was among forty organizations and individuals recently awarded a Distinctive Services Medal or Merit Medal by the Prime Minister of Cabo Verde, José Maria Pereira Neves. The presentation of medals was made at a “Gala Dinner & Cultural Evening” at the Venus de Milo restaurant in Swansea on September 26th. It was part of a five-month celebration that began in April of this year to commemorate the 40th anniversary of Cape Verde’s national independence. 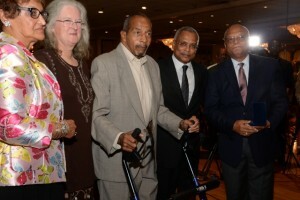 Other honorees included the Cape Verdean Association of Bridgeport, Onset Cape Verdean Festival Association and the Southern California Cape Verdean Association. valuable services to the Cape Verdean community in the U.S. and Cape Verde. SEMA was nominated and selected for its work in preserving the Schooner Ernestina-Morrissey. The ship is the official vessel of Massachusetts and a National Historic Landmark which was returned to Massachusetts as a gift to the people of the U.S. by the Republic of Cape Verde in 1982. Ernestina-Morrissey was then described as “an unmistakable catalyst in fostering a very special bond of friendship and human assistance from one country to another.” SEMA’s directors and supporters were recognized by the Prime Minister for their loyalty and perseverance in ensuring the Schooner is restored and treasured for its cultural and historical value. “Ernestina-Morrissey has always been much more than a ship for many of us in the Cape Verdean community. It is a symbol of the connections between Cape Verde and America, and it is a symbol of our cultural history. That has meant that we must do everything we can to make sure this ship doesn’t sink, and our history doesn’t get lost along with it,” said SEMA President Julius Britto after accepting the Medal. Commission Chair Laura Pires-Hester and SEMA President Julius Britto presented the Prime Minister with a copy of the new book "Phoenix of the Seas"
Currently, the Schooner is in Boothbay Harbor Shipyard in Maine, undergoing a total renovation, which is estimated to take three years and $6 million. SEMA was instrumental in securing over $5 million, both private and public funds, which have enabled her current restoration. SEMA continues to work to raise an additional $1 million to ensure that the current renovation is completed. When Ernestina-Morrissey is fully restored, she will return to Massachusetts and serve in an educational capacity, as she has in the past. This entry was posted in Commission, Membership and Outreach Committee, News. Bookmark the permalink.